What Seahorse? | Saltwaterfish.com Forums for Fish Lovers! Could you guys tell me what seahorse this is? Somebody has it in a three gallon pico reef. Is that enough space? Could he thrive in a two gallon? 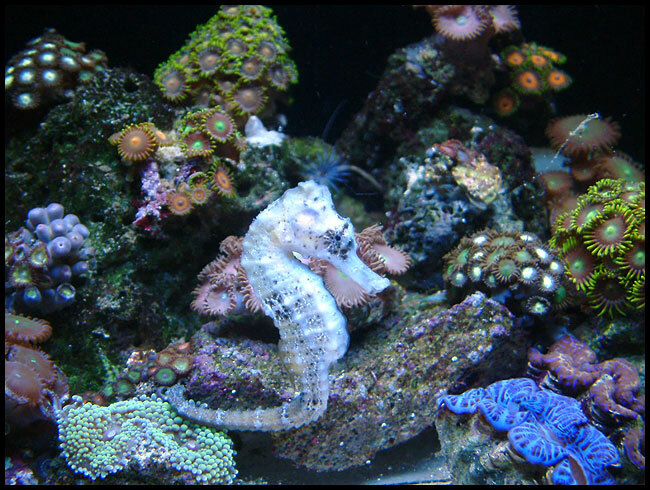 Would the seahorse hurt any corals? I think it would be super cool to have a pico reef with him in it. Looks like Hippocampus reidi to me. Will need a 30 gallon aquarium at the minimum. 3 gallons is absurdly small for anything but dwarf seahorses. You will need a 30g or larger tank (tall column tank is best). No they won't hurt corals...however they like cooler waters. 74 degrees, so to keep a seahorse healthy you need a chiller. Always get a captive bred seahorse that is already eating frozen food. This site sells Erectus, Seahorse.org sells other species.